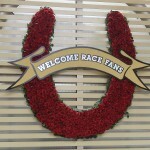 Want to see the Dubai World Cup (UAE-G1) in person? Attend this year’s Kentucky Derby (G1)? How about the Prix de l’Arc de Triomphe (Fr-G1)? Breeders’ Cup World Thoroughbred Championships? Melbourne Cup (Aus-G1)? See racing in Singapore? All of the above? If you have the cash, you can do just that, by yourself or with family and friends. You just have to know where to look. Jane Dempsey did not have to look far. In 1947, her mother, Ruth Dempsey Pyle, helped a bunch of friends in Southern California organize a train trip to the Kentucky Derby. Fifty-five years later, Jane Dempsey’s Kentucky Derby Junket is thriving, bringing racing fans from all over the West Coast to Louisville for the first Saturday in May. Dempsey’s mother, perfectly unaware she would be starting an institution, just wanted to see the world’s most famous horse race-in person. Her family had owned Thoroughbreds, and her husband, Jack, was operations manager at Santa Anita Park. She had attended the opening of Del Mar in 1937 and harbored thoughts of one day seeing the run for the roses. So was Derby day. “The roar of the crowd when the horses came onto the track, the playing of the ‘Star-Spangled Banner,’ and then everyone singing ‘My Old Kentucky Home,’ brought tears to my eyes and still do, for that matter,” she wrote. On the way back to Los Angeles, the group stopped at New Orleans. “We had such a marvelous time that many of our friends said, ‘Why don’t you put a trip together like that for next year?’ ” Pyle wrote. She and her daughter have been doing exactly that ever since. The junket took on a life of its own in the 1950s. One year there was a Mexican party on the train with musicians, tequila, and sombreros. Another year was a Hawaiian theme with Pyle arranging for leis to be flown to Denver to be given to her guests at a stop on the way to Kentucky. Other stopovers included Las Vegas, Ak-Sar-Ben in Omaha, St. Louis, Sportsman’s Park in Chicago, and Pikes Peak in Colorado, when each member in the traveling party was given a souvenir certificate for one foot of the mountain. One year-Dempsey guesses in the 1950s-actress Susan Hayward and her husband joined the group on Derby day. Her mother’s biggest thrill was when California-based Swaps won the 1955 Derby and then traveled back to California on the same train with the group. “Rex and Nola Ellsworth, the owners, and both rather reserved and somewhat shy, were visibly excited when they were introduced to the group attending the Kentucky Colonel’s Banquet the night before the Derby,” Pyle wrote. “Then, winning the race! I think our group made the loudest roar in the crowd. The Ellsworths returned from Kentucky with us-as did Swaps. He had his own private railroad car. Mesh Tenney, the trainer, stayed with him most of the way home. In 1964, a threatened railroad strike prompted the switch to air travel. Later in the decade, Jane Dempsey eased in as her mother’s replacement. “I don’t know anything else to do on the first Saturday of May,” said Dempsey, who runs her own travel agency, Far East Travel, in Los Angeles. She does it first class, though her tours in recent years do not include airfare. Upon arriving in Louisville for this year’s Kentucky Derby, her group will meet at the Executive West, the junket’s headquarters, for a welcome luncheon, on the Tuesday before the race. Many visiting horsemen stay at the same hotel. 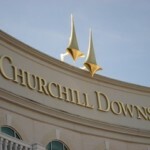 On the Wednesday schedule are breakfast at Churchill Downs’s track kitchen, a backstretch tour, a tour of the Jim Beam Distillery, lunch aboard Kentucky Railway dining cars, and visits to the Kentucky Railway Museum and Kentucky Derby Museum for the Derby post position draw. On Thursday, her group will tour Claiborne Farm, the Kentucky Horse Park, and Keeneland Race Course in Central Kentucky. 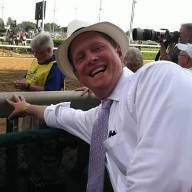 Friday begins with the Kentucky Oaks (G1) buffet breakfast, where two-time Eclipse Award-winning writer Billy Reed will speak, and continues with an afternoon at the track for the Oaks. Derby day is spent, of course, at the track. Dempsey offers three- and five-night packages with Clubhouse box seats on the first floor and the third floor. For Zamora, who has owned as many as 160 Thoroughbreds, including Classy Cara, who finished third in the 2000 Kentucky Oaks, the experience was a key reason he stepped up his involvement in racing. “My eyes opened up more to the horse business,” said Zamora, who runs a printing company called Graphic Press. “I started going with her in the ‘80s and it was a great experience. It was kind of neat because I was just getting into the horse business. We had a lot of friends in the horse business who went along. 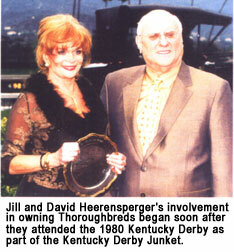 David and Jill Heerensperger of Bellevue, Washington, also saw what Thoroughbred racing is all about. 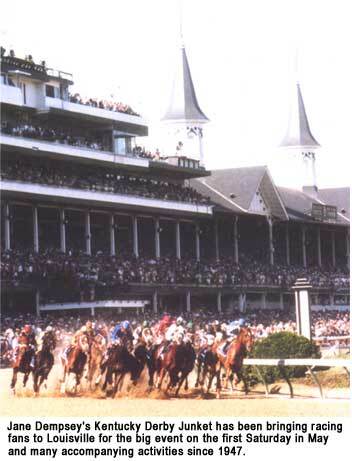 They bought spots on Dempsey’s Kentucky Derby Junket in 1980 at a charity auction for the arts in Seattle. “This was my first excursion into racing,” said Jill Heerensperger, who had grown up with show and dressage horses. She picked a good year to go. 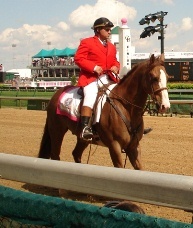 Genuine Risk became only the second filly to win the Kentucky Derby, and Jill had the winner. “I, not knowing anything, thought I had to bet on the girl,” she said. Two months later, the Heerenspergers bought their first Thoroughbred at a sale at Longacres. Last year, the couple’s Millennium Wind won the Blue Grass Stakes (G1) and Santa Catalina Stakes (G2) and finished 11th in the Kentucky Derby. Bill Heller is a New York correspondent of Thoroughbred Times.